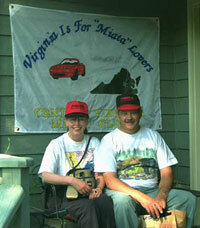 In memory of and in tribute to George Ferrell, founder of the Central Virginia Miata club. George was a Miata enthusiast through and through and he shared his love of the Miata with everyone he knew. He owned one of the first Miatas sold in the central Virginia area and he rallied other Miata owners in the region to form the Central Virginia Miata Club (CVMC). He established relationships with Mazda representatives, dealers, parts suppliers and other car clubs. He published the CVMC Newsletter monthly and created the original CVMC Web site, for which he served as the webmaster until his passing. George knew the history and details of the Miata inside and out and he maintained records and documentation on the Miata and Miata related trivia. George at Bridal Veil Falls... trailer in tow. 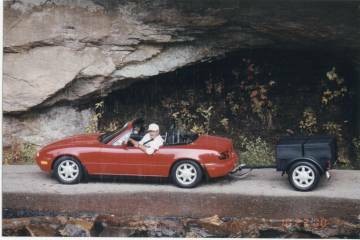 His love of the Miata not only took him throughout Virginia, but to places around the country, such as Deal’s Gap, Daytona Beach, the Indianapolis 500 track, Moab and New England. 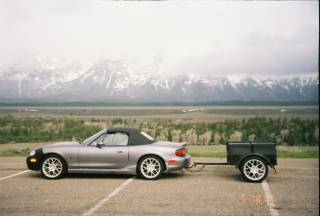 In addition to stateside travels, he even ventured to a Miata event across the border into Canada. Our memories of George will certainly conjure up a vision of him wearing a cap, sitting behind the wheel of his 2002 silver special edition with his custom made trailer in tow. He will always be appreciated and greatly missed. Safe travels George... until we meet again.